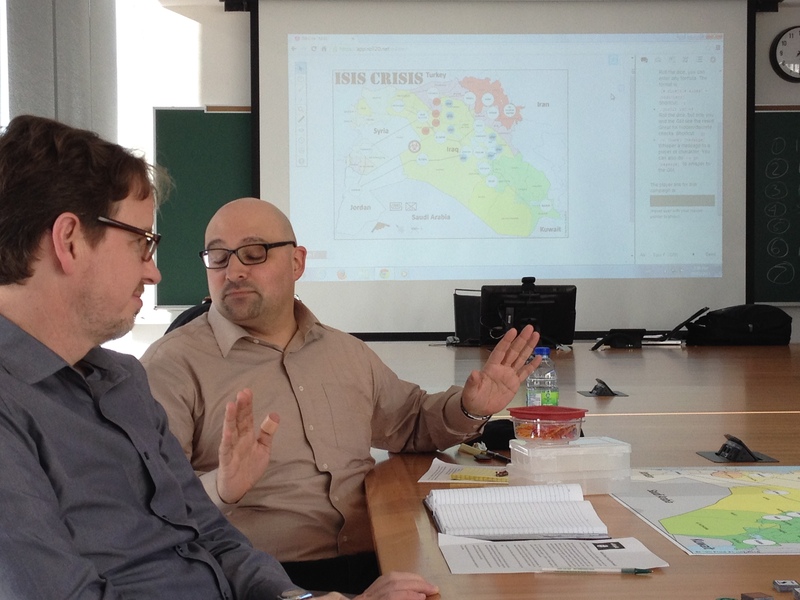 Last week a group of us assembled at the University of Ottawa to matrix-game the current conflict concerning the self-styled “Islamic State” in Iraq and Syria. For practical reasons and to limit the number of players/teams, the game largely focused on Iraq. The purpose, as with an earlier game held at the UK Defence Academy, was to explore the value and limits of matrix games as an analytical method. The phasing player announces an intended action and the desired effect if successful (“The Iraqi Army will attack city X, defeating ISIS forces there and recapturing it.”). A base score of 7 or more on two six-sided dice is needed for success. The phasing player then identifies reasons why their action would be successful (“I have substantially greater forces available in this area than the defender. My forces are better armed. Iranian advisors are deployed with my forces. I enjoy US air support. In addition, my forces have been bolstered by Shiite irregulars rallying to the call-to-arms issued by Ayatollah Sistani.”) Each plausible argument gains a +1 to the dice roll. Other players may contribute arguments for or against the success of the proposed action. (“You will fail because your army is corrupt and your troops poorly led. In addition, the Sunni inhabitants of the city have been alienated by Shiite rhetoric and the excesses of Shiite militias, and will resist you. The morale of the ISIS defenders is high. The lack of forward air controllers means that US close air support is largely ineffectual.”) Each positive argument contributes +1, each negative argument -1. The dice are rolled, adjusted for arguments pro and con, and an outcome determined. The facilitator has some leeway both in accepting the validity of arguments, and in specifying results based on the dice: a very high score would mean a very successful result (“the enemy is destroyed and your morale bolstered”), while a very low score would mean a disastrous failure (“you suffer a catastrophic defeat, and will suffer a penalty to your next combat operation”). The map and the various units and other markers on it are largely used to represent and help illustrate the unfolding narrative, rather than being an essential and central part of game play. In this game (as it our previous experiment) players were assigned various initial characteristics. The Iraqi government suffered a -1 penalty to all dice rolls to reflect corruption and inefficiency, and an additional -1 when conducting combat operations outside Baghdad or Shiite-majority areas. The Kurds similarly suffered a -1 to all military operations outside Kurdish areas. ISIS gained a +1 bonus in Sunni areas, and a -1 outside. The Sunni opposition also gained a +1 bonus in Sunni areas, but suffered a -2 penalty acting against ISIL. The US suffered a -1 penalty to military actions, reflecting Washington’s unwillingness to get too deeply involved. Iran, should it take an unsuccessful action against ISIL or the Sunni opposition, provided that actor with a +1 to their next roll to reflect an anti-Iranian backlash among Iraqi Sunnis. Finally, the”Curse of Unforeseen Consequences and Second and Third Order Effects” mandated that any time a double was rolled ISIS would get an immediate free counter-action. These initial conditions worked well in tilting players towards realistic behaviours without over-determining actions and outcomes. As we had done before, a seventh unaffiliated subject matter expert was able to take one action per turn so as to highlight the consequences of player actions, introduce actions by other unrepresented actors, or nudge the game back towards more realistic outcomes—again, without over-determing the course of events. As one possible future narrative of the “ISIS crisis” it all went very well. ISIS made initial efforts to expand its territorial control southwards closer to Baghdad, but was unable to do so. Consequently it embarked on a series of terrorist bombings in the capital, hoping thereby to pin down government troops. In the north the Kurds focused on building up their military strength, both to defend themselves from the ISIS threat and to bolster any future efforts to assert independence. Neither the US nor Iran would provide them with the heavy weapons they sought, such as tanks or tube artillery. The Kurds skirmished with ISIS forces around Mosul, but were reluctant to undertake a major offensive. Indeed, their one effort to infiltrate the outskirts of the city went badly. Iran undertook a major build-up of troops along the Iraqi border, and sent additional military advisors to assit Iraqi and Kurdish forces. It coupled this, however, with extensive outreach to the United States. Over time, the two sides were increasingly successful in deconflicting their operations and actions. The Iraqi Army launched a major offensive to clear ISIL and allied militias from Diyala province, as well as to secure Taji and Samarra and even push on towards Tikrit. They faced stiff resistance, however. Progress was slow, and even when areas were captured the Iraqi security forces were still subject to numerous IED and sniper attacks. A second offensive was then launched to secure Falluja and press on towards Ramadi. Again, progress was slow. Efforts to reform the Iraqi Army and improve its combat effectiveness were unsuccessful. All this fighting created a growing humanitarian crisis as populations fled areas of combat. The US increased its contributions to the UN and other humanitarian agencies to help address the problem. The US launched a high-risk special forces operation to rescue an American hostage held by ISIS in Raqqa, Syria. This was unsuccessful. ISIS retaliated by executing the hostage. Unable to capture additional terrain in Iraq, ISIS undertook a surprise raid against Jordanian border positions in an effort to project a sense of political momentum. This was initially more successful than anyone anticipated, but was soon driven back by Jordanian and American troops. Throughout the game, both the US and Iran urged Baghdad to reach out to dissatisfied Sunnis and lure them away from the ISIS orbit. In practice, little of this happened. On the contrary, the Iraqi government increasingly relied on Shiite militias to bolster its strength, and offered little in the way of compromise or inclusion. The Sunni opposition—whose extensive demands were likely too much for the government in any case—only grew angrier. As Iran’s role grew, the Sunni opposition exploited this to secure some modest financial support from Saudi Arabia. Finally, Tehran decided enough was enough, and pressed hard on Baghdad to open formal reconciliation talks with credible Sunni opposition leaders. The Iraqi government balked, then agreed provided the talks were held in Baghdad. The Sunni opposition insisted on a more neutral location. Tehran proposed Oman—and, when the Iraqi Prime Minister initially declined, made it clear that rejection was NOT an option. Prime Minister al-Abidi reluctantly agreed. Players were required to develop strategies in a dynamic adversarial context. While we did not heavily instrument the playtest (two participants were tasked with taking notes), it would be quite simple to require players to record their actions and rationale as part of game play. Game play generated long lists of factors that might enable or undermine particular actions. It also generated debates among players around the nature and importance of those factors. To some extent game play is distorted by the limited number of teams (6-7 seemed a practical limit if a lively discussion was also to be maintained) and the consequence simplification of Iraqi and regional politics. Then again, players are not limited to arguments pertaining to their own actors, but can invoke those not represented in the game. The “seventh” player/subject matter expert also helped to assure that unrepresented issues, actors, and consequences could be brought into the game. As suggested above, the trajectory of the game is certainly shaped by both the actors represented and any special rules or initial conditions assigned to them. However, this session also highlighted how important the social engineering of team assignments and roles can be. Players who were calm and calculating tended to play their roles in this way; others who were more likely to be confrontational tended to play their roles that way too. I suspect that, even with everything else held constant, the game outcome would have been quite different with different people in different roles. I found the Iraq simulation an interesting exercise. The methodology might be adaptable for the purposes of thinking about analytical issues related to Iraq. It is a good way to induce analysts to think about aspects of the situation that they might not consider otherwise or look at differently. However, I wouldn’t see it an alternative to an analytical discussion session, but rather as a preliminary step. The model I would see is a two-part session, starting with 2-3 hours for the simulation and then continuing with another couple of hours of discussion revolving around lessons and insights inspired by the game. The game by itself has limited analytical usefulness. Inevitably, players get caught up in the competitive game aspect of the simulation and take whatever steps they can think of to “win,” quibbling about the game mechanics, making unrealistic moves, etc. Some players might get too personally invested in the game and lose sight of the fact that the purpose is to get a deeper understanding of the situation and to think differently than they normally would about it. For example, the reasons put forward for the success or failure of a move are not necessarily well thought-out in the heat of the fray. One possible way around this would be to require the players to list in writing their arguments for and against a move: this would slow things down just a bit and hopefully inspire better arguments. It would also have the advantage of providing a record of the arguments for the later discussion. Insights from players on aspects of the simulation that surprised them: do they now have a different impression of the strategic situation of one or more sides, of the tactical options available to them (and the restraints they are under), a different understanding of the overall balance of forces, etc. A more considered discussion of the pros and cons for each of the (major) moves during the simulation: were all of the relevant factors considered, were they given proper weighting, etc. This is where a written record of the arguments would be useful, recorded either by the players at the time and given to the umpire, or compiled by neutral observers. Thoughts from the players on the goals being pursued by their side; their goals may well have shifted as the game progressed. The introductory notes outlining the situation for each side logically contain general guidance on what that side should be seeking to accomplish, but I must say that in my case I did not pay much attention to the notes and leaped in with my own views on what I wanted to achieve. I think a subsequent discussion of actual and game goals would have been useful. Overall, a very interesting exercise, and one that has forced me to rethink my previous (rather negative) views of the potential usefulness of simulations in intelligence analysis. 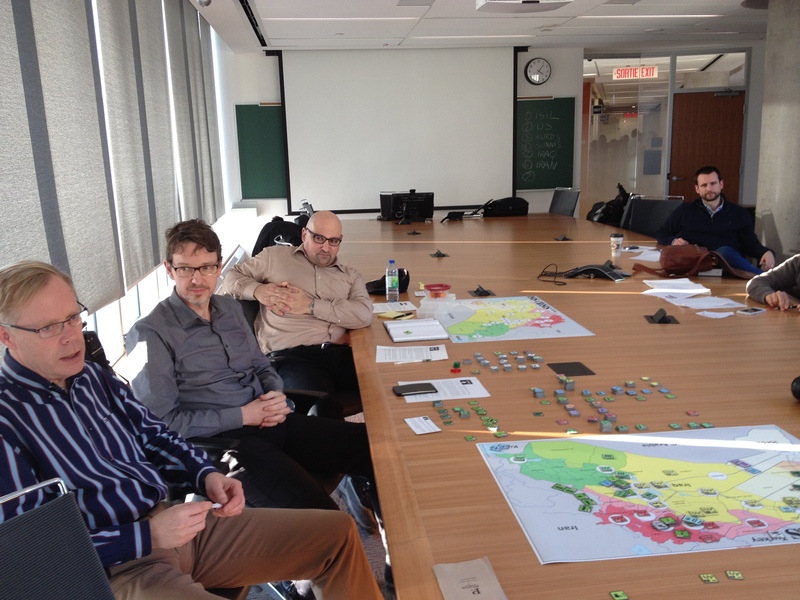 Materials for an earlier version of the ISIS Crisis matrix game (including the map and counters seen above) can be found at Tom Mouat’s matrix game download page. The briefings used for the game described above can be found here. For more information on matrix games see also Matrix Games for Modern Wargaming, published by the History of Wargaming Project. 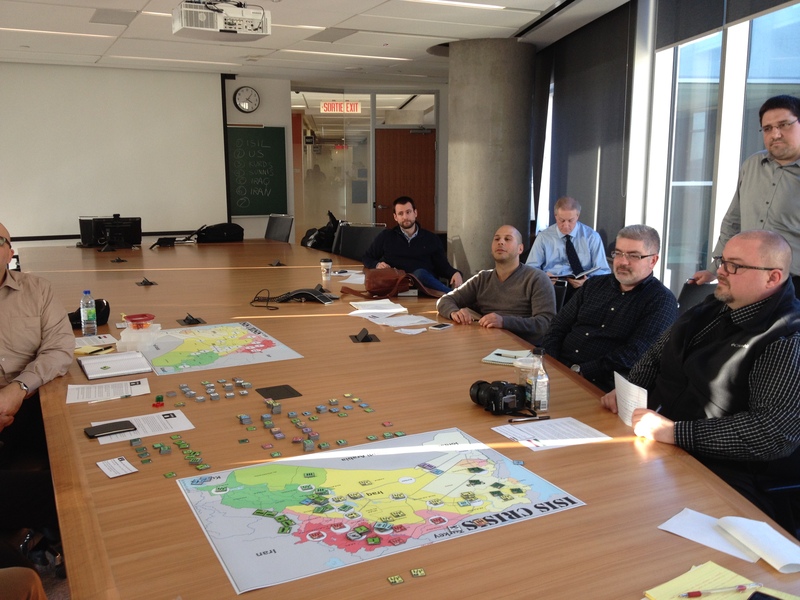 The situation in Iraq and Syria and the proclamation and potential expansion of the Islamic State has been simulated and played out among experts which included wargamers, game designers, political scientists, Middle East intelligence analysts, and operations research analysts. The simulation shows the limitation and advantages of ‘playing’ geopolitics. 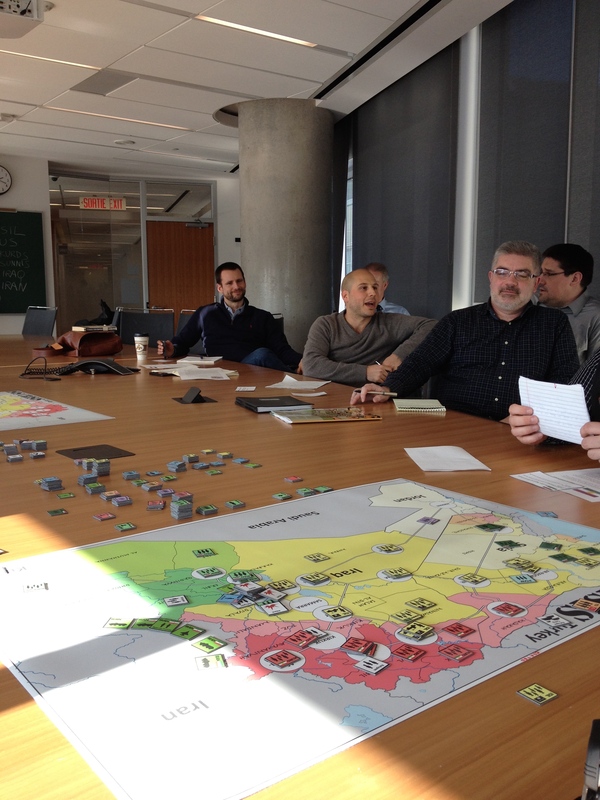 While it helps thinking through some analytical issues related to the present situation in the Middle East, simulating through a board game may not provide an exhaustive picture of the dynamics and forces in the real world. Play and the ludic aspects of such exercise may take over more serious analytical intentions as players focus on winning. The game focuses on Iraq’s efforts to fight the Islamic State, leaving Syria beyond the human player’s control.